This morning we caught the opening of the stunningly spectacular production of Disney's Beauty and the Beast at Chicago Shakespeare. 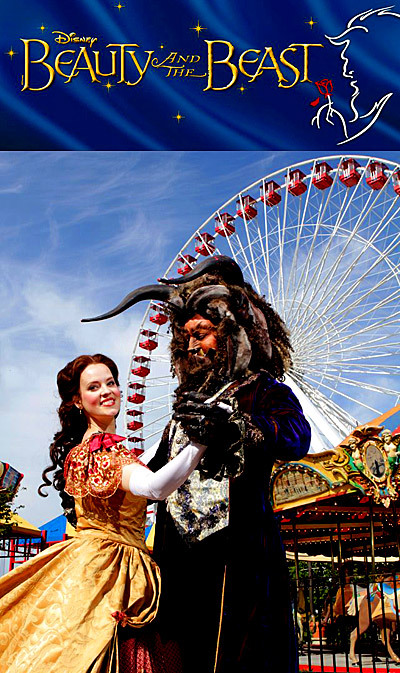 We'd seen the Broadway version, so our expectations were high, and we were not disappointed. We'll have a photo filled full review up soon. The next two days West Fest is going down. Temps are finally a high of 88 and going down to a high of 81 Sunday, which feels downright spring like after 100+ heat index all week. So venture outta the air conditioning and see some fun bands, theater, or Ren Faire Fun. We'll bring you our photo filled adventures from Bristol Renaissance Faire after Sunday. Check out our recent Ren Fair coverage & details here. Click this link for free 12 & under kids' admission and a printable coupon for $4.95 off for adults for opening weekend, along with announcements of new acts. 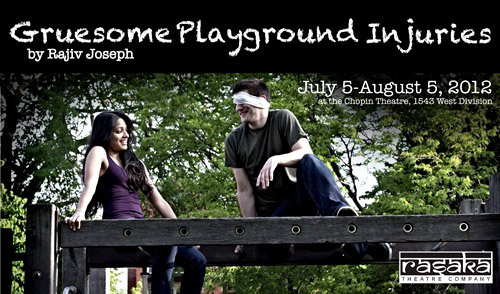 Tonight we're super stoked to be going to the opening of Gruesome Playground Injuries at The Chopin Theatre! In Rajiv Joseph’s masterful play, an accident prone dare devil and a corrosive masochist navigate friendship, love and the squishy parts that lie in between. 8-year-olds Doug and Kayleen meet in a school nurse’s office, beginning a lifelong intimacy which is revealed through the physical and emotional injuries they sustain over 30 years. Gruesome Playground Injuries tells a different kind of love story through sharp humor and even sharper insights into the human condition. Our full review will be up shortly. neighborhood restaurants, retailers, and artists. the renowned local venue Empty Bottle Presents. Click here for the complete 2012 live music line up. **We highly recommend checking out He's My Brother She's My Sister today at 4pm! They were amazing at Empty Bottle a few months back and we'll have loads of live video footage and show still for you soon. They're fronted by a talented actual brother/ sister duo and have a rockin' girl drummer who tap dances on one drum while wailing on the rest. Amazing! arts and music programming for those hard to please tweens and teens. Rift, Cero, Revise, CMW and more... Click here for complete Kid Fest stage line up. Style Pet Shop and Green Dog Inc.
gift bag containing freebies and coupons. local non-profits providing services for the immediate neighborhood.